Since today is #NationalCatDay, lets take a look at the science behind cats always landing on their feet! More often then not cats will actually land on their feet after some gravity defying stunts. BUT there are times where they don’t always nail the landing. A cat’s innate ability to reorient its body during a fall is called the righting reflex. This reflex is observable in kittens as young as 3 weeks old and by 7 weeks, the righting reflex is fully developed. The righting reflex is made possible because cats have a highly-tuned sense of balance and a very flexible backbone, which allows them to twist their bodies around to right themselves when they fall. Cats have something called a vestibular apparatus located in their inner ear that acts as a balance system to allow them to determine up from down when falling. 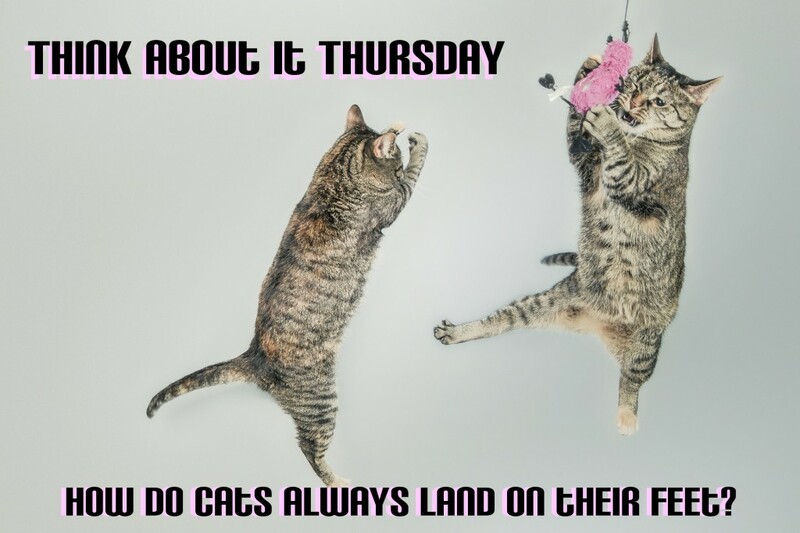 Light bone structure and thick fur also help aid them in softening their landings. Some cats will “flatten” out their bodies in order to decrease terminal velocity and create more resistance to air to make them fall more slowly. A BBC article from earlier this year explains that cats don’t weigh much in comparison to their surface area, which means that they reach terminal velocity at slower speeds than a human would. A typical cat might hit terminal velocity at 60 mph, while an adult human would fall about twice as quickly. This terminal velocity slows a cat down enough to give it the time it needs to twist their spine to reorient itself and land right side up!